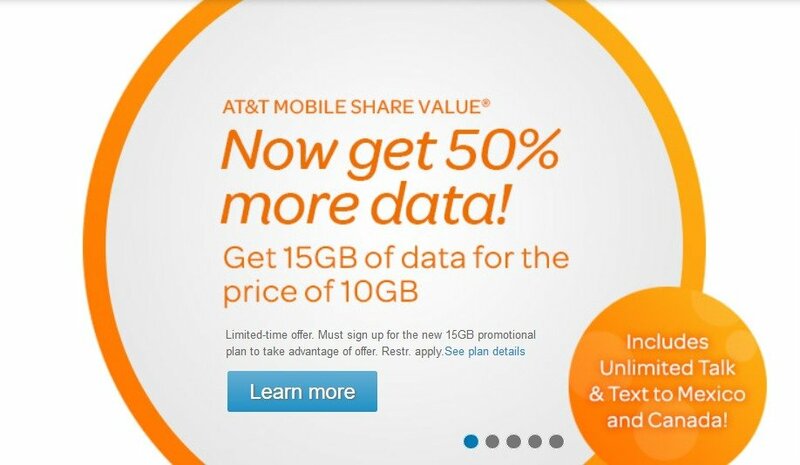 AT&T has announced changes to its Mobile Share plans which for some customers will either outright reduce the cost of their monthly bill or for others increase their data allotments while keeping their monthly bill at the same price. Monthly plans have changed such that a customer can get 300 MB 4G LTE data for $20, 2 GB for $30, and 5 GB for $50 instead of 6 GB for $70. Previously $100 got you 10 GB of data, under the new pricing structure customers will receive 15 GB for that same amount of money. The 20 GB data plan got a price reduction by $10 to $140. ATT charges a $25 line access charge for smartphones on plans that include 5 GB of shared data or less. Plans with more than 5 GB of monthly data will have a $15 line access charge. If you purchase your smartphone on a 2 year contract, the line access charge is $40 regardless of the amount of data you have. Plans with 15 GB or more of data receive unlimited calling and texting to Mexico and Canada. BestMVNO.com readers of course know that ATT's prices can be beaten by simply switching to an ATT MVNO. Cricket Wireless for instance charges $105 for 3 lines with unlimited talk, text and data with the first 5 GB per line at 4G LTE data 1)Cricket Wireless throttles LTE data download speeds to 8 Mbps on 4G LTE devices. Upload speeds are not throttled speeds. Cricket's plan also includes unlimited calling and texting to Mexico and Canada, unlimited international SMS, and unlimited talk and text while roaming in Mexico. On ATT a similar plan will cost you $145/month ($100 for 15 GB of data plus 3 x $15/line access charges). Cricket’s int’l sms is unlimited to 35 preselected countries only of their choosing correct? Thisis what I read a few weeks back. Has it been opened up to global sms now? Nope. Not much different. The list is at 38 countries now. not much of an incentive IMO.the int’l sms holds me back from porting over. the data allotment on their $35 monthly plan with auto pay is not bad. ATT MVNO AirVoice still offers unlimited int’l sms to anywhere.i haven’t received any sms send failures to the counties i text and i know i have sent more than a hundred at one point in time to several countries.